© Estate of Arthur Nevill Kirk. Arthur Nevill Kirk was a renowned metalworking instructor at the Central School of Arts and Crafts in London when George Booth invited him to relocate to Detroit in 1927. Kirk assumed a postion at the Detroit Society of Arts and Crafts and was commissioned to produce an ecclesiastical plate for Christ Church Cranbrook. The following year, Kirk moved his family to Cranbrook, where he turned out a variety of works while overseeing the Silver Shop associated with the early Academy of Art operations. 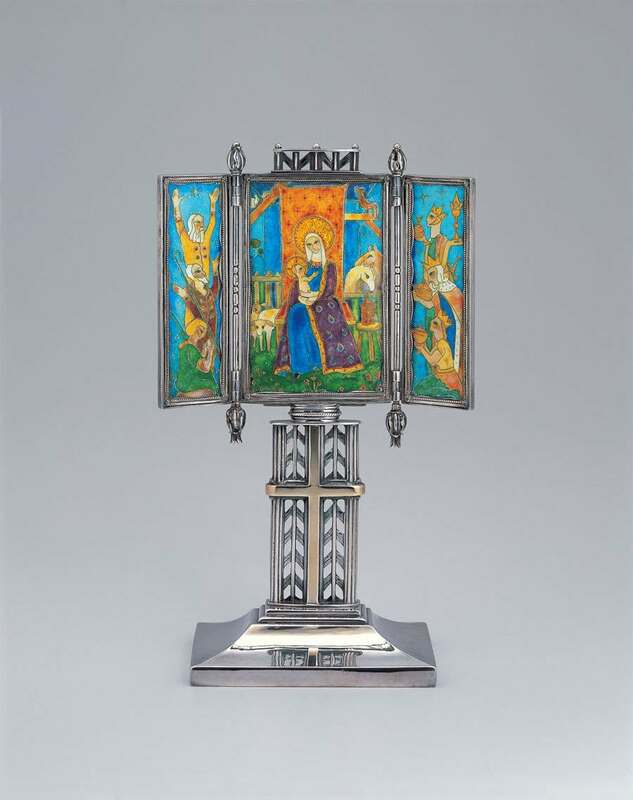 This triptych in gold and silver and translucent enamels was executed in 1940 while Kirk taught metalwork and jewelry at Wayne University in Detroit. The delicately rendered cloissonné enameling depicts the Magi’s gifts to the Christ child. Kirk’s remarkable technical skills as a silversmith and his predilection for traditional design is apparent in the crafting of the triptych’s casing, support and base. In spirit, it echoes an earlier triptych that won Kirk a gold medal at the famous 1925 Art Deco exposition in Paris.